Weinberg sophomore Neha Basti receives a check after winning the Improve NU Challenge. Basti pitched The Ad Meliora Initiative to create mental health resilience programming. 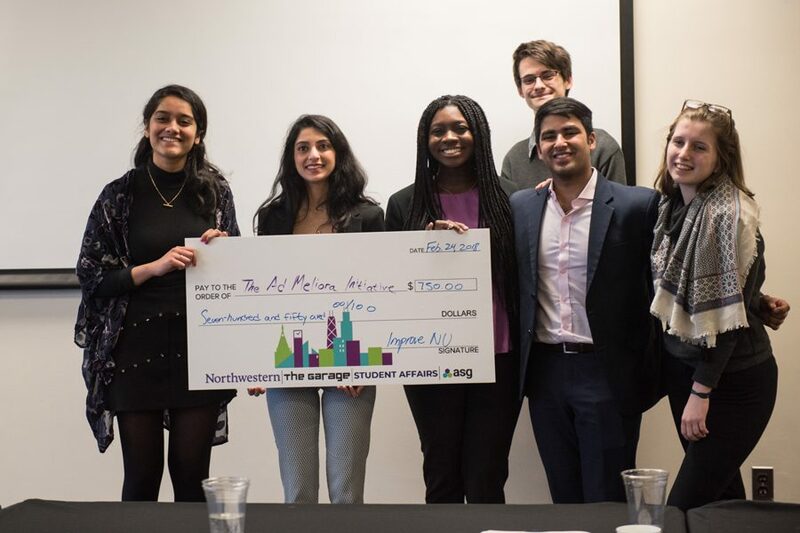 The inaugural Improve NU Challenge, hosted by Associated Student Government, featured more than two dozen teams in a Saturday pitch competition for prize money and residency in startup incubator The Garage. Students had the opportunity over the past week to work in teams of up to four to identify and propose solutions to problems they see on campus. The top three winners received money to help start implementing their ideas over Winter and Spring Quarter with ASG support. The Ad Meliora Initiative, the first-place team, won $750 in prize money and a residency at The Garage. AMI will also receive $7,000 from Student Affairs to implement their ideas. The group — whose name means “towards better things” in Latin — will create resilience programming to improve students’ mental health, creator Neha Basti said. Basti said AMI became an idea last spring, and since then has partnered with the Health Promotion and Wellness office. However, the group decided to participate in Improve NU because Basti said it felt limited and thought ASG could provide more resources. Basti said AMI hopes to begin a trial program Spring Quarter. During the first four weeks of the quarter, students would attend 90-minute sessions focused on personal awareness and values, perfectionism and imposter syndrome, building resilience, and maintaining and building meaningful relationships. In the last five weeks of the quarter, Basti said there would be drop-in sessions for students, culminating in a reading week check-in. Second-place winner N.Struct received $500 in prize money plus $3,000 from Student Affairs. Weinberg juniors Emily Zaniker and Laura Derenge created N.Struct to address the lack of teaching experience opportunities for undergraduates. They suggested an expansion and rebranding of student-run classes. The third-place winner, Wildcat Wellness, received $250 in prize money, in addition to $1,000 from ASG for implementation. McCormick senior Brian Gonzalez and Weinberg sophomores Matthew Urban, Christopher Holland and Ash Mahenthiran pitched the idea to install vending machines with hygiene and sexual health goods in student housing. Groups began semi-final presentations before three judges, usually two administrators and one student, at 9 a.m. Saturday in Norris University Center. After a lunch break and feedback session with the judges, nine finalist teams pitched to 10 judges until about 4 p.m.
ASG Chief of Staff Lars Benson was one of the student judges. Benson said some of the judges’ evaluation criteria were ASG’s values, the University’s plans, accessibility, inclusion, implementation and cross-discipline engagement. ASG Senator Sid Ahuja pitched the idea for this competition to ASG last fall based on his participation in a similar program at University of Texas at Austin, where he transferred from this year. Ahuja, a McCormick sophomore, said it was “a dream come true” to see all of the ideas presented at the competition.